Groupon released its Q3 earnings and announced that it has named Rich Williams as its new CEO as Eric Lefkofsky steps down. Williams was appointed by the board, effective immediately as Lefkofsky returns to his role as Chairman of the Board. As for Groupon’s financials, the company announced gros billings of $1.47 billion, revenue of $713.6 million, GAAP loss per share of $0.04 and non-GAAP earnings per share of $0.05. CHICAGO–(BUSINESS WIRE)– Groupon, Inc. (NASDAQ: GRPN) today announced financial results for the quarter ended September 30, 2015. The company also announced that Chief Operating Officer Rich Williams will assume the role of Chief Executive Officer. Outgoing CEO Eric Lefkofsky will once again serve as Chairman of the Board of Directors. Outgoing Chairman Ted Leonsis will now serve as Lead Independent Director. “Over the past few years, we’ve repositioned the business for success and strengthened our foundation. On a trailing twelve-month basis, we generated $3.1 billion in revenue, $1.4 billion in gross profit, $283 million in adjusted EBITDA and $228 million in free cash flow,” Lefkofsky said. Gross billings, which reflect the total dollar value of customer purchases of goods and services, was $1.47 billion in the third quarter 2015, compared with $1.49 billion in the third quarter 2014. Gross billings declined 2% globally, but grew 6% excluding the unfavorable impact from year-over-year changes in foreign exchange rates throughout the quarter. On this F/X neutral basis, North America billings increased 12%, EMEA declined 1% and Rest of World was approximately flat. Revenue was $713.6 million in the third quarter 2015, compared with $714.3 million in the third quarter 2014. Revenue was approximately flat, but grew 7% excluding the unfavorable impact from year-over-year changes in foreign exchange rates throughout the quarter. On this F/X neutral basis, North America revenue increased 11%, EMEA increased 2% and Rest of World declined 5%. Gross profit was $328.9 million in the third quarter 2015, compared with $355.3 million in the third quarter 2014. Excluding the $26.4 million unfavorable impact from year-over-year changes in foreign exchange rates throughout the quarter, gross profit would have been$355.4 million. Adjusted EBITDA, a non-GAAP financial measure, was $56.3 million in the third quarter 2015, compared with $63.9 million in the third quarter 2014. Net loss attributable to common stockholders was $27.6 million, or $0.04 per share. Non-GAAP earnings attributable to common stockholders was $32.5 million, or $0.05 per share. Third quarter 2015 results include pre-tax charges of $24.1 million and $37.5 million related to the previously announced restructuring program and securities litigation, respectively, a $13.7 million pre-tax gain from the sale of a controlling stake in Groupon India and a$17.8 million income tax benefit from a reduction in liabilities for uncertain tax positions. Operating cash flow for the trailing twelve months ended September 30, 2015 was $316.4 million. Free cash flow, a non-GAAP financial measure, was negative $35.3 million in the third quarter 2015, bringing free cash flow for the trailing twelve months ended September 30, 2015 to $227.8 million. Cash and cash equivalents as of September 30, 2015 was $963.6 million and borrowings against our revolving credit facility were $195.0 million. Definitions and reconciliations of all non-GAAP financial measures are included below in the section titled “Non-GAAP Financial Measures” and in the accompanying tables. Units: Global units, defined as vouchers and products sold before cancellations and refunds, increased 1% year-over-year to 52 million in the third quarter 2015. North America units increased 11%, EMEA units increased 1% and Rest of World units declined 23%. Active deals: At the end of the third quarter 2015, on average, active deals were nearly 570,000 globally, with over 290,000 in North America. Both include the addition of approximately 80,000 Coupons. Active customers: Active customers, or customers that have purchased a voucher or product within the last twelve months, grew 4% year-over-year, to 48.6 million as of September 30, 2015, comprising 25.2 million in North America, 15.4 million in EMEA, and 8.0 million in Rest of World. Customer spend: Third quarter 2015 trailing twelve month billings per average active customer was $132, compared with $137 in the third quarter 2014. During the third quarter 2015, Groupon repurchased 44,149,663 shares of its Class A common stock for an aggregate purchase price of $192.9 million. Up to $268.1 million of Class A common stock remains available for repurchase under Groupon’s share repurchase program throughAugust 2017. The timing and amount of any share repurchases are determined based on market conditions, share price and other factors, and the programs may be discontinued or suspended at any time. Groupon’s outlook for the fourth quarter reflects current foreign exchange rates, as well as expected marketing investments in customer acquisition. For the fourth quarter 2015, Groupon expects revenue of between $815 million and $865 million. This guidance anticipates nearly 400 basis points of unfavorable impact on the year-over-year growth rate from changes in foreign exchange rates. Groupon expects Adjusted EBITDA for the fourth quarter 2015 of between $40 million and $60 million, and non-GAAP earnings per share of between negative $0.01 and positive$0.01. A conference call will be webcast live today at 4:00 p.m. CST / 5:00 p.m. EST, and will be available on Groupon’s investor relations website athttp://investor.groupon.com. This call will contain forward-looking statements and other material information regarding the Company’s financial and operating results. Groupon encourages investors to use its investor relations website as a way of easily finding information about the company. Grouponpromptly makes available on this website, free of charge, the reports that the company files or furnishes with the SEC, corporate governance information (including Groupon’s Global Code of Conduct), and select press releases and social media postings. In addition to financial results reported in accordance with U.S. generally accepted accounting principles (U.S. GAAP), we have provided the following non-GAAP financial measures in this release and the accompanying tables: foreign exchange rate neutral operating results, adjusted EBITDA, non-GAAP net income attributable to common stockholders, non-GAAP earnings per share and free cash flow. These non-GAAP financial measures, which are presented on a continuing operations basis, are intended to aid investors in better understanding Groupon’scurrent financial performance and its prospects for the future as seen through the eyes of management. We believe that these non-GAAP financial measures facilitate comparisons with our historical results and with the results of peer companies who present similar measures (although other companies may define non-GAAP measures differently than we define them, even when similar terms are used to identify such measures). However, non-GAAP financial measures are not intended to be a substitute for those reported in accordance with U.S. GAAP. For reconciliations of these measures to the most applicable financial measures under U.S. GAAP, see “Non-GAAP Reconciliation Schedules” and “Supplemental Financial Information and Business Metrics” included in the tables accompanying this release. Stock-based compensation. We exclude stock-based compensation because it is primarily non-cash in nature and we believe that non-GAAP financial measures excluding this item provide meaningful supplemental information about our operating performance and liquidity. Acquisition-related expense (benefit), net. Acquisition-related expense (benefit), net is comprised of the change in the fair value of contingent consideration arrangements and external transaction costs related to business combinations, primarily consisting of legal and advisory fees. The composition of our contingent consideration arrangements and the impact of those arrangements on our operating results vary over time based on a number of factors, including the terms of our business combinations and the timing of those transactions. We exclude acquisition-related expense (benefit), net because we believe that non-GAAP financial measures excluding this item provide meaningful supplemental information about our operating performance and facilitate comparisons to our historical operating results. Depreciation and amortization. We exclude depreciation and amortization expenses because they are non-cash in nature and we believe that non-GAAP financial measures excluding these items provide meaningful supplemental information about our operating performance and liquidity. Interest and Other Non-Operating Items. Interest and other non-operating items include: interest income, interest expense, gains and losses related to minority investments, and foreign currency gains and losses. We exclude interest and other non-operating items from certain of our non-GAAP financial measures because we believe that excluding these items provides meaningful supplemental information about our core operating performance and facilitates comparisons to our historical operating results. Items That Are Unusual in Nature or Infrequently Occurring. For the three and nine months ended September 30, 2015, items that we believe to be unusual in nature or infrequently occurring were (a) charges related to our restructuring program, (b) the gain on our disposition of Groupon India, (c) the write-off of a prepaid asset related to a marketing program that was discontinued because the counterparty ceased operations and (d) the expense related to a significant increase in the contingent liability for our securities litigation matter. We exclude items that are unusual in nature or infrequently occurring because we believe that excluding those items provides meaningful supplemental information about our core operating performance and facilitates comparisons to our historical results. Foreign exchange rate neutral operating results show our current period operating results as if foreign currency exchange rates had remained the same as those in effect in the comparable prior-year period. We present foreign exchange rate neutral information to facilitate comparisons to our historical operating results. Adjusted EBITDA is a non-GAAP financial measure that we define as net income (loss) from continuing operations excluding income taxes, interest and other non-operating items, depreciation and amortization, stock-based compensation, acquisition-related expense (benefit), net and other items that are unusual in nature or infrequently occurring. Our definition of Adjusted EBITDA may differ from similar measures used by other companies, even when similar terms are used to identify such measures. Adjusted EBITDA is a key measure used by our management and Board of Directors to evaluate operating performance, generate future plans and make strategic decisions regarding the allocation of capital. Accordingly, we believe that Adjusted EBITDA provides useful information to investors and others in understanding and evaluating our operating results in the same manner as our management and Board of Directors. the income tax effect of those items. We believe that excluding these items from our measures of non-GAAP net income (loss) attributable to common stockholders and earnings (loss) per share provides useful supplemental information for evaluating our operating performance and facilitates comparisons to our historical results by eliminating items that are non-cash in nature, relate to discrete events or are otherwise not indicative of the core operating performance of our ongoing business. Free cash flow is a non-GAAP financial measure that comprises net cash provided by (used in) operating activities from continuing operations less purchases of property and equipment and capitalized software from continuing operations. We use free cash flow, and ratios based on it, to conduct and evaluate our business because, although it is similar to cash flow from operations, we believe that it typically represents a more useful measure of cash flows because purchases of fixed assets, software developed for internal-use and website development costs are necessary components of our ongoing operations. Free cash flow is not intended to represent the total increase or decrease in Groupon’s cash balance for the applicable period. The statements contained in this release that refer to plans and expectations for the next quarter, the full year or the future are forward-looking statements within the meaning of Section 27A of the Securities Act of 1933, as amended, and Section 21E of the Securities Exchange Act of 1934, as amended, that involve a number of risks and uncertainties, and actual results could differ materially from those discussed. The words “may,” will,” should,” “could,” “expect,” anticipate,” “believe,” “estimate,” intend,” “continue” and other similar expressions are intended to identify forward-looking statements. The risks and uncertainties that could cause our results to differ materially from those included in the forward-looking statements include, but are not limited to, volatility in our revenue and operating results; risks related to our business strategy, including our marketing strategy and spend and the productivity of those marketing investments; the impact of our shift away from lower-margin products in our Goods category; effectively dealing with challenges arising from our international operations including fluctuations in currency exchange rates; retaining existing customers and adding new customers, including as we increase our marketing spend and shift away from lower-margin products in our Goods category; retaining and adding new and high quality merchants; cyber security breaches; incurring expenses as we expand our business; competing successfully in our industry; maintaining favorable payment terms with our business partners; providing a strong mobile experience for our customers; delivery and routing of our emails; maintaining a strong brand; managing inventory and order fulfillment risks; integrating our technology platforms; managing refund risks; retaining, attracting and integrating members of our executive team; litigation; compliance with domestic and foreign laws and regulations, including the CARD Act and regulation of the Internet and e-commerce; tax liabilities; tax legislation; maintaining our information technology infrastructure; protecting our intellectual property; completing and realizing the anticipated benefits from acquisitions, dispositions, joint ventures and strategic investments; seasonality; payment-related risks; customer and merchant fraud; global economic uncertainty; our ability to raise capital if necessary; difficulties, delays or our inability to successfully complete all or part of the announced restructuring actions or to realize the operating efficiencies and other benefits of such restructuring actions; higher than anticipated restructuring charges or changes in the timing of such restructuring charges; and the impact of our ongoing strategic review and any potential strategic alternatives we may choose to pursue. For additional information regarding these and other risks and uncertainties, we urge you to refer to the factors included under the headings “Risk Factors” and “Management’s Discussion and Analysis of Financial Condition and Results of Operations” in the company’s Annual Report on Form 10-K, Quarterly Report on Form 10-Q for the quarter ended September 30, 2015 and our other filings with the Securities and Exchange Commission, copies of which may be obtained by visiting the company’s Investor Relations web site at http://investor.groupon.com or theSEC’s web site at www.sec.gov. Groupon’s actual results could differ materially from those predicted or implied and reported results should not be considered an indication of future performance. You should not rely upon forward-looking statements as predictions of future events. Although Groupon believes that the expectations reflected in the forward-looking statements are reasonable, it cannot guarantee that the future results, levels of activity, performance or events and circumstances reflected in the forward-looking statements will be achieved or occur. Moreover, neither the company nor any other person assumes responsibility for the accuracy and completeness of the forward-looking statements. 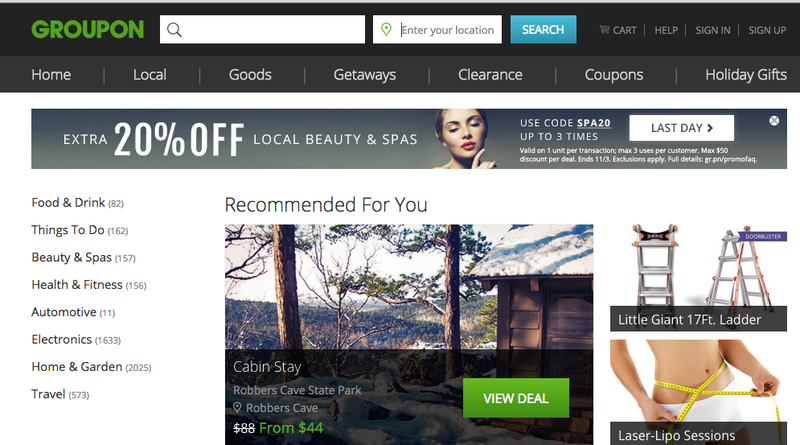 The forward-looking statements reflect Groupon’s expectations as of November 3, 2015. Groupon undertakes no obligation to update publicly any forward-looking statements for any reason after the date of this release to conform these statements to actual results or to changes in its expectations. Groupon (NASDAQ: GRPN) is a global leader of local commerce and the place you start when you want to buy just about anything, anytime, anywhere. By leveraging the company’s global relationships and scale, Groupon offers consumers a vast marketplace of unbeatable deals all over the world. Shoppers discover the best a city has to offer on the web or on mobile with Groupon Local, enjoy vacations with Groupon Getaways, and find a curated selection of electronics, fashion, home furnishings and more with Groupon Goods. The financial results of Ticket Monster, including the gain on disposition and related tax effects, are presented as discontinued operations in the accompanying condensed consolidated financial statements and tables for the nine months ended September 30, 2015. Additionally, the assets and liabilities for Ticket Monster are presented as held for sale in the accompanying condensed consolidated balance sheet as of December 31, 2014. All prior period financial information and operational metrics have been retrospectively adjusted to reflect this presentation. (1) Represents the total dollar value of customer purchases of goods and services, excluding applicable taxes and net of estimated refunds. (2) Represents the change in financial measures that would have resulted had average exchange rates in the reporting periods been the same as those in effect during the three and nine months ended September 30, 2014. (1) Other income (expense), net includes foreign currency losses of $5.2 million and $18.6 million for the three months ended September 30, 2015 and 2014, respectively, and foreign currency losses of $22.1 million and $20.1 million for the nine months ended September 30, 2015 and 2014, respectively. (2) Segment cost of revenue and operating expenses and segment operating income (loss) exclude stock-based compensation and acquisition-related expense (benefit), net. (3) Segment cost of revenue and operating expenses for North America for the three and nine months ended September 30, 2015 includes a$37.5 million expense related to an increase in the Company’s contingent liability for its securities litigation matter. (4) Segment cost of revenue and operating expenses for the three and nine months ended September 30, 2015 includes restructuring charges of $1.4 million in North America, $19.7 million in EMEA and $3.0 million in Rest of World. (5) Segment cost of revenue and operating expenses for EMEA for the three and nine months ended September 30, 2015 includes a $6.7 million expense for the write-off of a prepaid asset related to a marketing program that was discontinued because the counterparty ceased operations. Adjusted EBITDA, non-GAAP earnings attributable to common stockholders and non-GAAP earnings per share are non-GAAP financial measures. The Company reconciles Adjusted EBITDA to the most comparable U.S. GAAP financial measure, “Net income (loss) from continuing operations” for the periods presented and the Company reconciles non-GAAP earnings per share to the most comparable U.S. GAAP financial measure, “Diluted net income (loss) per share,” for the periods presented. (1) Includes stock-based compensation classified within cost of revenue, marketing expense, and selling, general and administrative expense. Other expense (income), net, includes $0.02 million and $0.1 million of additional stock-based compensation for the three months endedJune 30, 2015 and the three months ended September 30, 2015, respectively. (1) For the nine months ended September 30, 2015, a $4.4 million loss related to the cumulative translation adjustment from the Company’s legacy business in the Republic of Korea was reclassified to earnings as a result of the Ticket Monster disposition. Foreign exchange rate neutral operating results are non-GAAP financial measures. The Company reconciles foreign exchange rate neutral operating results to the most comparable U.S. GAAP financial measures, “Gross billings,” “Revenue” and “Income (loss) from continuing operations,” respectively, for the periods presented. The Company reconciles “foreign exchange rate neutral Gross billings growth” and “foreign exchange rate neutral Revenue growth” to year-over-year growth rates for the most comparable U.S. GAAP financial measures, “Gross billings growth” and “Revenue growth,” respectively, for the periods presented. (1) Represents the financial statement balances that would have resulted had average exchange rates in the reporting periods been the same as those in effect during the three and nine months ended September 30, 2014. (2) Represents the increase or decrease in reported amounts resulting from changes in exchange rates from those in effect in the comparable prior periods. (3) Represents the financial statement balances that would have resulted had average exchange rates in the reporting periods been the same as those in effect during the three and nine months ended June 30, 2015. The following is a quarterly reconciliation of foreign exchange rate neutral Gross billings growth from the comparable quarterly periods of the prior year to reported Gross billings growth from the comparable quarterly periods of the prior year. The following is a quarterly reconciliation of foreign exchange rate neutral Revenue growth from the comparable quarterly periods of the prior year to reported Revenue growth from the comparable quarterly periods of the prior year. (1) Represents the financial statement balances that would have resulted had average exchange rates in the reporting period been the same as those in effect during the three months ended September 30, 2014. (2) Represents the increase or decrease in reported amounts resulting from changes in exchange rates from those in effect in the comparable prior year period. (2) Local represents deals from local merchants, deals with national merchants, and deals through local events. Other revenue transactions include advertising, payment processing, point of sale and commission revenue. (3) Includes third party revenue, direct revenue and other revenue. Third party revenue is related to sales for which the Company acts as a marketing agent for the merchant. This revenue is recorded on a net basis. Direct revenue is primarily related to the sale of products for which the Company is the merchant of record. These revenues are accounted for on a gross basis, with the cost of inventory included in cost of revenue. Other revenue primarily consists of advertising revenue, payment processing revenue, point of sale revenue and commission revenue. (4) Represents third party revenue, direct revenue and other revenue reduced by cost of revenue. (5) Represents the change in financial measures that would have resulted had average exchange rates in the reporting periods been the same as those in effect in the prior year periods. (6) Reflects the total number of unique user accounts who have purchased a voucher or product from us during the trailing twelve months. (7) Reflects the total gross billings generated in the trailing twelve months per average active customer over that period. (8) Includes merchant sales representatives, as well as sales support from continuing operations. (9) Financial information and other metrics have been retrospectively adjusted to exclude Ticket Monster, which has been classified as discontinued operations. (10) The definition, methodology and appropriateness of each of our supplemental metrics is reviewed periodically. As a result, metrics are subject to removal and/or change.